Nintendo's DS Lite continues to dominate the attention of Japanese consumers, notching up ever increasing weekly sales through the past four pre-Christmas weeks - even as Sony's PSP pushed ahead of Nintendo's other star, the Wii. According to figures from Japanese market watcher Media Create, some 222,132 DS Lites were purchased in the week to 16 December, well ahead of all the other key games consoles. The Wii's 170,558 units continued that platform's growth pattern, but weren't sufficient to allow it to once again outsell the PSP, which jumped back into second place thanks to sales of 184,610 units. Indeed, total up the sales for the four weeks covered here and the PSP leads the Wii, 425,744 units to 414,741. The DS' total is 631,672. 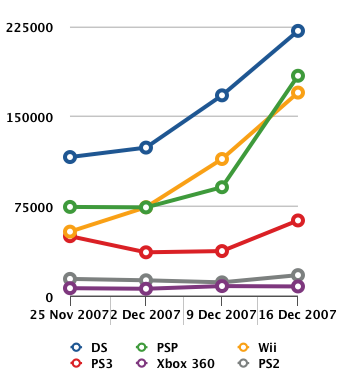 The PS3, meanwhile, saw is sales bounce back after a slide over the past few weeks, but it's still nowhere near matching the demand the Wii is experiencing, let along the PSP and DS Lite. Sony's old PS2 continues to sell steady numbers, picking up from last week's dip almost equal and opposite to the rise and then drop in demand for Microsoft's Xbox 360 over the same period. In the West, we may like to line the Wii, PS3 and Xbox 360 up against each other, but in Japan the Microsoft machine is perhaps viewed more as the PS2's prime competitor.